It has become an annual tradition – politicians and school officials gather to celebrate that more students in Connecticut are graduating each year from high school. “The fact that more young people than ever before are earning high school diplomas is a testament to the hard work and commitment of so many teachers, principals, superintendents…” Dianna Wentzell, the state’s education commissioner, said during a press conference this spring at Wilbur Cross High School in New Haven. But before anyone gets too excited about this jump in graduation rates – from 83 to 88 percent over the last seven years – data shows that many students are not learning what they should before they leave high school. So what does a high school diploma actually signify? Here are three things to know about those who graduate from high school in Connecticut. At least 17 percent of those in the Class of 2012 had to take non-credit courses to learn reading, writing or math skills they should have acquired in high school. The rate of students showing up unprepared for college is likely higher, however. While three out of every four students who graduate high school go on to enroll in college, the state does not track where students are at academically when they enroll in a private Connecticut college, out-of-state college, or at The University of Connecticut. Many of these schools have placement exams that determine the academic proficiency of incoming students. That means Connecticut only tracks the students who enrolled in a community college or at the four regional state universities, which accounts for about one-third of the state’s students who go on to college. Nearly half of those from the Class of 2012 who enrolled in these public colleges needed remedial courses. The 2012 data, which is the most recent available, was presented to the State Board of Education this week. While even students from districts that are traditionally high-performing need remedial courses, much higher rates of students from chronically struggling districts require remedial education when they get to college. Students from historically underserved groups – black, Hispanic, and those from low-income families – also more often tend to show up for college in need of high school-level instruction. 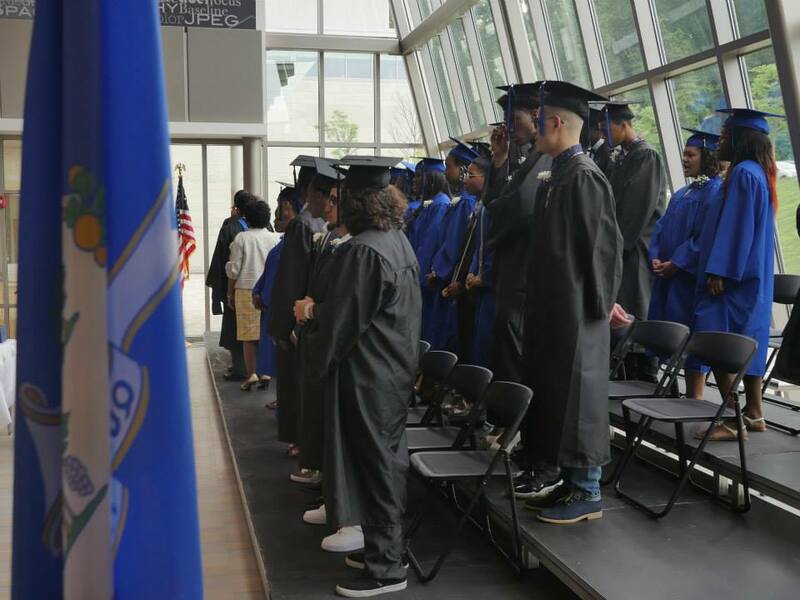 The superintendents of the schools in Bridgeport and Windham testified during a school funding trial in 2016 that it is possible for students to get a diploma from their districts — and be illiterate. That’s because Connecticut does not require students to meet any competency standards to earn a diploma. The judge overseeing the case found this frustrating. The Connecticut Supreme Court ultimately decided, however, that it is not the court’s role to get involved in how districts award diplomas. State lawmakers have since retreated from plans that would have required students to pass end-of-course exams and complete more credits to earn a diploma. Research is mixed on the impact of exit exams. (See here, here, here and here.) Fifteen states last school year required students to pass exit exams to earn a diploma, and five other states have passed laws requiring it in the future. However, 10 states have dropped exit exams since 2011, reports the Education Commission of the States, a nonprofit think tank that tracks state laws. Instead of focusing on end-of-course exams, the state has instead pursued two different reforms. The first – aimed at ensuring students are college-ready after graduation – raises the bar on what will be included when the state rolls out new tests that are aligned with the Common Core State Standards. The rollout of Common Core testing was incredibly controversial. Hundreds of teachers, students and others opposed to testing rallied outside the state Capitol, legislators held special hearings on the issue, dozens of bills were filed to restrict implementation, and the state’s largest teachers union ran TV and radio ads to put pressure on lawmakers. But Gov. Dannel P. Malloy and the Democratic-controlled General Assembly dug in and provided $38 million over two years to transition to a new test for 2014-2015 — the Smarter Balanced Assessment — that is aligned with the Common Core standards. It’s unclear what impact these new, higher expectations will have on the number of students showing up for college unprepared. The most recent year for which data is available is from the Class of 2012 — group of students who graduated before the full potential benefits of the Common Core standards could be assessed. The second state reform was aimed at overhauling how the community college system handles the 40,000 students who show up each year academically unprepared for college-level courses. In 2012, state law changed to limit how much time – and money – students could spend in non-credit courses at college. Instead, the colleges would be required to provide struggling students with short, intense non-credit courses to catch them up before they are allowed to enroll in courses for credit with an array of supports – such as tutors – so they don’t fall behind. That reform also was passed too recently for current data to reflect its impact. William Gammell, director of research and system effectiveness for the Board of Regents, which oversees the community colleges, said research on the impact of those changes will be released later this month. Last week, however, he gave a preview to the state education board. “You can see improvement,” he said, referring to improved college graduation rates.